Ocean Mechanics, an Earth Science unit, will be followed by Ocean Ecosystems, Oceans & Society, and Ocean Engineering. Respectively these using touch upon Life Science, Social Studies, and Engineering. 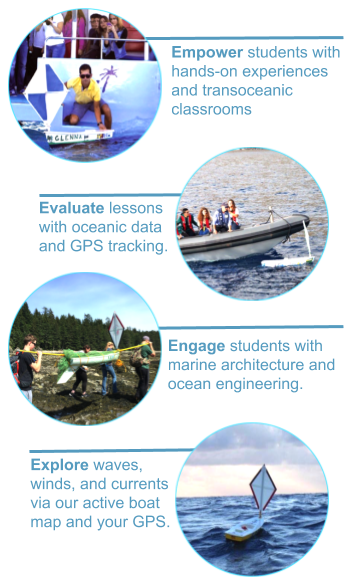 This multidisciplinary approach to environmental education will be aligned to NGSS and C3 Social Studies Standards but is anchored in the Ocean Literacy Principles outlined below. The program will also be aligned to the Ocean Literacy Principles. OLP-1 The Earth has one big ocean with many features. OLP-2 The ocean and life in the ocean shape the features of Earth. OLP-3 The ocean is a major influence on weather and climate. OLP-3 The ocean is a major influence on weather and climate. OLP-4 The ocean made Earth habitable. OLP-5 The ocean supports a great diversity of life and ecosystems. OLP-1 The Earth has one big ocean with many features. OLP-6 The ocean and humans are inextricably interconnected. OLP-7 The ocean is largely unexplored. OLP-3 The ocean is a major influence on weather and climate. OLP-7 The ocean is largely unexplored.